PRICE REDUCED!!! MOTIVATED SELLER.You will love this stunning two story home nestled in a desirably tranquiled cul-de-sac in the community of Hampton Park. 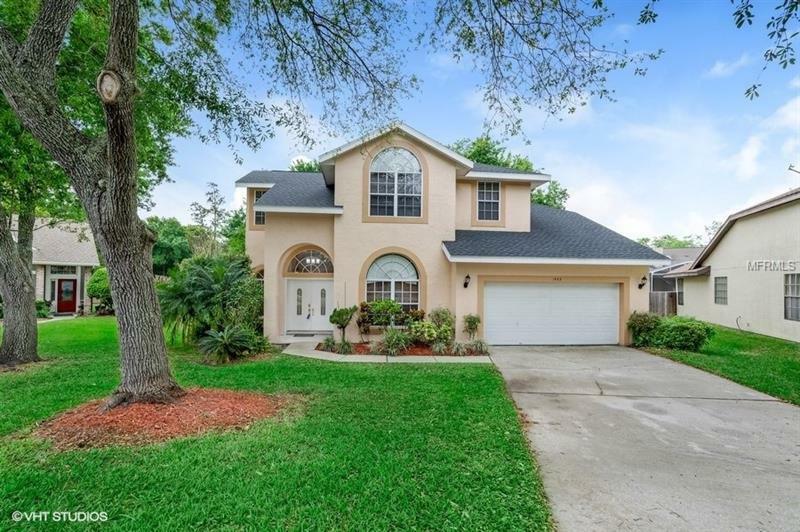 This spacious 4 bedroom 2.5 bath home is a little over 2500 sq. Ft. and has two car garages and a huge private backyard. Flooring is ceramic tile throughout most of the first floor and laminate wood throughout all bedrooms. As soon as you walk in, you are welcomed to high ceilings, a beautiful curved stairway and a formal living/dining with an abundance of natural lighting through skylights. You are then lead to a large casual living room with airy (vaulted ceiling height) featuring large sliding doors that lead to a beautifully landscaped large backyard and screened in patio area. Downstairs features half a bath, a large master bedroom with a full bathroom and a custom walk in closet. The master bath has an over-sized garden tub, walk in shower and his and her sinks The kitchen features stainless-steel appliances, granite counter-tops, island, breakfast bar, eat-in area and open to the Family room and perfect for entertaining. Upstairs features three bedrooms and a full bathroom perfect for a growing family. New energy efficient AC 2019, complete re-pipe 2015 and a new roof 2018. Zoned for Seminole County Top-Rated Schools. Home is ready for a quick move in. Community is ideally positioned to shops, Sun-rail, Sanford Airport and I-4.